The Bar Human Rights Committee has published the formal trial observation notes from its observations at the Catalan Referendum Trial in February 2019. 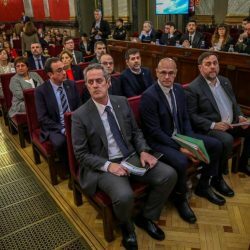 The observations of the hearing of the 12 former members of the Catalan government took place from 19 to 20 February at the Supreme Court Madrid on Tuesday 19 and Wednesday 20 February. The observation was conducted by Professor Bill Bowring, an Executive Committee member of BHRC and President of the European Lawyers for Democracy and Human Rights (ELDH). The full trial observation note is available here. You can read coverage of Professor Bowring’s observations in the Catalan News here.